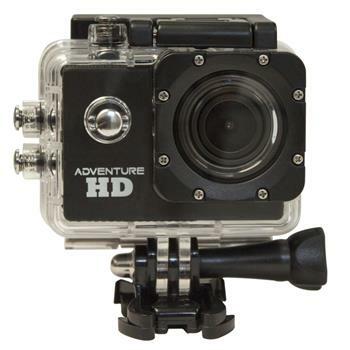 Adventure HD action-sports camera is built specifically for those looking for an adventure, 365 days a year. The Adventure HD provides consumers the high definition quality they’re looking for, at a price point they can afford. The Adventure HD camera includes more accessories in the box than competitor cameras, giving consumers more value for their dollar. It includes a waterproof housing, a spare housing backdoor, waterproof case clip, 3 straight joint mounts, basic buckle, j-hook buckle, tripod adapter, tripod mount, flat adhesive mount, curved adhesive mount, USB cable, Velcro strap, zip ties, wire tether, a cleaning cloth and extra adhesive stickers. This affordable action-camera is perfect for consumers who want to simply record their everyday adventures, without paying for all the additional features they would never use. The Adventure HD consumer wants an action-sports camera that shoots high definition video, captures high resolution still photos, and has a few extra features such as motion detection, loop recording, adjustable ISO, exposure and white balance.